“Clap Hands and Sing” shows us a lonely — but rich and powerful — old man who has only one wish before he dies: To go back in time and take an opportunity for love that he once let slip by. But what will it do to the young girl who used to love him? “Lifeloop” pretends to be reality TV twenty-four hours a day. In fact, they’re really actors. But when your character is you, without any break, how exactly do you have a “real” life? And how can a fellow actor tell you that he loves you, when that’s what the script also calls for him to say? “Sepulchre of Songs” is about a heartbreakingly lovely girl who lost her arms and legs many years ago, and now yearns to be free, not just of the rest home where she lives, but of her body. So is the alien being who wants to trade places with her real or the product of her own imagination? And can her therapist’s growing love for her keep her from fleeing — either into space or the dark recesses of her own mind? Three Orson Scott Card short science fiction stories and three one-act adaptations of the same comprise the bulk of this limited edition (only 750 were published) hardcover book and audio CD set. 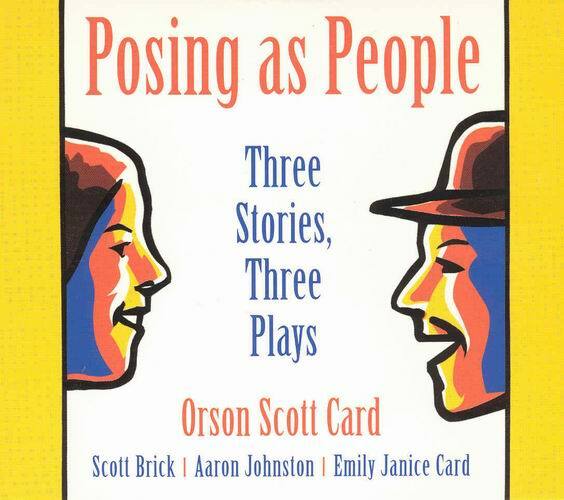 Posing As People: Three Stories, Three Plays was released in the wake of the 2004 premiere of the stage play of the same name. Everything found on the four Compact Discs can be found in the paper book – minus the actual aural performances. 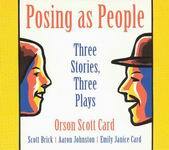 The paper book also includes a foreword by Card, an introduction to the play “Clap Hands And Sing” by author Scott Brick, an afterword to play “Life Loop” by author Aaron Johnston, an afterword to the play “A Sephulcre of Songs” by author Emily Janice Card, and three afterwords, one for each of the original short stories, by Orson Scott Card. 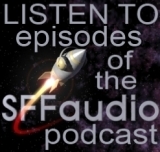 The CDs of course are the heart of our real interest here at SFFAUDIO. On the CDs, first come the three plays, all multi-actor performances with sound effects – basically exactly what you would have experienced were you sitting in the theater in Los Angeles with your eyes closed. Following the three plays are the original three short stories as read by one individual reader each. I think the plays all fail to deliver as audio drama. This is not due to any adaptational problems of the play’s adaptors, rather I think it was a mistake not to make the plays video DVDs. Each play was specifically adapted for the stage – and not constructed to work on their own as audio dramas. For instance – there is very little sense of place in the audio of the plays – but there is a great sense of place in the audiobooks that the plays are based on. By simply recording the audio they’ve cut off that sense of space. Thus I think they don’t work on their own as audio dramas. On the other hand, if you saw the original plays in Los Angeles these might adequately allow you to revisit the performances. All three adaptations, or what I experienced of them, are very well performed and the sound effects are used to good effect but the true power of the stories doesn’t materialize without the visual component. Contrarywise, the readings of the original short stories all work perfectly. The original text is very evocative visually, and provide a emotional richness lacking in the soundtrack to the three plays. That said, some work better than others. “Lifeloop” is the best of the three plays as it the most talky of the dramatizations. Of the unabridge short story readings “A Sephulcre Of Songs” works best, narrator Robert Forster reads with a poignant sadness that is truly heart-rending. The only drawback is there is a slight hiss in this particular recording.